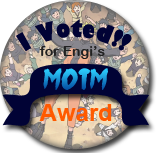 Every Now and Again - Engi no Jutsu - The Best Naruto RP on the Net! He watched her as she tended the noodles, the smell rising out of the pot and filling the canteen, drawing a few looks from the hungrier of his clanmates. Ten, whether she knew it or not, was under observation. Unprescribed leave, disappearing during the night, it had all drawn the attention of Maeda Uryu, the building manager. Several of the clan’s elders had tried to pass it on her age – in truth, Kazuhiko agreed with the others; it was rare to see a teenager that wanted to stay at home – but Uryu had insisted that she was up to something. It seemed that most of the complaints came from her neighbors, something that Kazuhiko hadn’t chalked up to much. Yet, here he was tasked with a glorified babysitting job. “You know her,” Uryu had told him. The blonde knew about as much of his distant cousin as he did about the heiress that he had traveled to the surface with. It seemed that the nonshinobi of his clan had some kind of belief that all shinobi were intimately acquainted. It was a farfetched tale at best, discrimination at worst. Either way, the blonde knew that he couldn’t stay propped up against a vending machine on the far wall and keep looking at her without saying anything, regardless of how good he was at stalking his prey. “The soup looks good. Udon noodles?” He slunk across the canteen, plopping down next to his cousin. It was rare for him to wear any textiles; he usually generated his own chitin constructs, but this time, he wore a grey jogger’s uniform, complete with ballcap. He took a gander over at the small crowd that had grown around them. The Maeda were by no means destitute, but several of his poorer relatives often gathered around the communal kitchens with notions of being fed. He preferred to avoid them. Ten was no really in the mood when the laky and tall Kazuhiko sat down next to her. She was very familiar with the man at this point and the skills that he held. She had done battle with him and he was willing to bet her life on his when it came to people you wanted to fight along side. However, she was not really the type to ask for peoples recognition and because of the attention she was starting to grab she gave the man a good hard look and then looked at the crowd forming around her. She knew that she could kill every man out there but she didn’t want to do that. She wanted to be able to enjoy her food in peace. ”How do you do it? I mean how do you deal with all these people wanting from you but then somewhat shunning you? I bet in their eyes we are some types of creatures; the types of men and woman that can be heroes and then villains. Like I don’t want to feed these people because some of them show resentment towards us, no matter how much we try to help them. I know some of them didn’t ask for this but like what am I to them? What are you to them?” Ten stated as she stood up and left her food. She was no longer hungry and the idea that she would be begged food for the duration of her meal left a sour taste in her mouth. She also didn’t let the man speak in response to her questions but she figured that the man would follow. From a distance, he would follow her. She was heading to a more quiet spot within the compound, a small nook she liked to think of as her space. It would be there she would talk. Last edited by Cayuga; 03-31-2018 at 06:14 AM.. The older Maeda cocked his head thoughtfully to one side. If there was one thing he knew about, it was teenage angst. He smiled as a small child was the first to approach with a small, outstretched bowl. She was a young Maeda, evident by the chitinous structures that had begun forming around her elbows and up her arms. Shinobi could suppress the formations, but when it came to the civilian population, the structures would always form and drop off after their strain’s breeding cycle ended. After reaching for the ladle, he offered the child a decently sized helping before turning his attention back to his cousin. He looked thoughtful for a moment as the adults started towards them, feeding themselves and aiding the other children nearby. It all seemed good natured, but a few looks lingered on the two for a bit too long. Long enough for Ten to leave in a huff. He supposed that he should follow. Ten stopped walking as Kazuhiko began to talk. His words seemed to mellow her out in a way and the image of him handing over food to a child that truly needed it; a child that was infected with the karamushi. Ten could tell she was no shinobi by the way the chitin ridged skin laced her body. It was disgusting to say the least, and even though Ten used it as a weapon, in a normal circumstance it wasn’t that great of a sight to behold. Luckily, Ten was able to harness the power of the worms, she just felt bad for the ones that could not. Then as the crowd began to continue to circle she couldn’t take it any longer and left the situation. She wanted nothing more then to just feel something good and she knew that she would not find it by feeding some kids and grown adults. The way Kazuhiko proposed the monster idea made her a little interested. ”What would you have in mind? I feel like everyone here already calls me a monster. I mean I am a proud Maeda but I feel like I was born into something I just never understood. I never had a mother to teach me these things and I was young when I lost my father. I am alone in this compound and I fear that I always will be. I hear things of my mother still being alive but I don’t want to go….” Ten suddenly stopped speaking as she realized she had gone too far. The things she had saw with Renko at the weird cult churches were not supposed to be said. Could she trust the Jounin with her secrets? She had fought beside him but she didn’t really know him; she didn’t really know Renko either. What would she do. Kazuhiko’s eyes traced over his cousin’s body, looking for cues and other distinctions as she spoke. It hadn’t taken too long to find out why exactly it was that she was disappearing in the middle of the night – the older Maeda, however, didn’t know whether or not what she was doing was actually dangerous. As a jounin, he was privy to a lot of clan secrets – a cult was the least of the council’s concerns. They were more focused on stalling the clan’s politics, drawing lines in the sand, and picking either to side with Toru or Shuuya when it came to making tough decisions. The manner in which Ten trailed off led the jounin to believe that she had promised someone some kind of secrecy. It made sense; he doubted that the chuunin was capable of uncovering all the information that she had by herself. Rather than question her, he continued the conversation as normal. If it was a pertinent issue, she would press it: Kazuhiko had already obtained the knowledge he was tasked with getting. He shrugged at her next comments. Talking about his family wasn’t something that he liked doing. Despite being loyal to his clan, he preferred to distance himself from close ties. In truth, he only had his mother and grandmother left – his mother had killed his father, after all. ”How do you do it day in and day out? I don’t mean killing and doing the missions your assigned, but being able to look at these karamushi and not wanting something else? These things have saved me multiple times but look at the things we do around the area, even the village will suffer from us. I just feel like it would be better if we all left? Do you think there is a group out there, away from this whole place that is constructing a life for the infected?” Ten stated knowing the actual answer to her question. However, she felt like she wanted to know what Kazu knew. Ten was not one to be so forward with her questions but she was really starting to wonder whether or not she would want to be cured of the karamushi if it was even possible. She could see how strong her cousin was and how he had embraced the power of the worms. She felt the same once but ever since her thing with the cult hidden underneath the nose of everyone in the compound, she wasn’t sure about anything anymore. One other thing was the monster or person that transformed into a monster; would that happen to her? She knew only her mother and the weird cult leader knew the answers. Peering over Kazu’s shoulder she noticed that all the food was gone and that some of the sick were heading towards the duo once again. It was something she was not willing to deal with anymore and slowly and secretly she started to secrete her chitin on her back to create scorpion tails. She would not deal so nicely with people if they bothered her this time. Despite being a chuunin, Ten appeared to have a tendency for wearing her heart on her sleeve. Kazuhiko could read into what she was saying despite trying not to. She wouldn’t have been talking this way if she hadn’t saw something. For her sake – for the clan’s sake – he decided to try and quash her notion of there being a better life away from Amegakure. The last thing the Maeda needed was a clan member going rogue because she felt some type of way. He offered the girl a sheepish grin, outstretching a hand as he surged chakra into it. The karamushi inside him seemed to respond, and within a few moments, several bug-like structures made of chitin appeared in his hand. A few looked like small beetles, others like moths, and a few like worms. All food for birds – what he had produced was no different than what the two saw growing on the young girl earlier. The two continued to walk – Kazuhiko could sense a few stragglers behind them, but they were clan members for the most part. Sure, a few were the random bums that would get infected and then make their way to the Maeda compound, knowing that they’d be offered treatment and food, if only out of guilt, but still. It took a lot to intimidate the jounin – a few people with no sense of direction were the least of his worries. As her clothing shuffled with the formation of chitin, Kazuhiko said nothing. It wasn’t that he hadn’t noticed, just that he wasn’t worried. Ten could feel the love resonating from Kazu at the time of his speech. She knew that her threat of leaving was idle and that there was no way she would survive escaping the Village. She had heard stories of Youkai, the way they moved, they were demons to the normal people and monsters to the shinobi. She had heard stories of a specific man, a large man with the strength of a god, someone that would even possibly defeat Lady Amekage. No, she did not want to be forgotten, even though that’s how she felt. She felt a sort of calmness rush over her as her cousin continued to speak. She really liked the idea of talking out her problems and she enjoyed the idea of being able to really get her emotions out. She had wanted this kind of session for a long time and was really wishing she could have more of them. The brutish men that were trailing them had seemed to get the hint as the scorpion tail revealed itself under her garb. She didn’t really want to harm anyone anymore and it was the calming words of the Jounin that had stopped her. Now she needed to figure out what she could really tell Kazu and hopefully, she wasn’t killing herself by doing this. ”There…there is a group of Maeda hiding within the confines of the sewers. I remember how I got there but I am afraid to go back. There were things that I saw that would scare even you I fear. Can you accompany me to that place? It was there that I felt my mother. I am almost certain it is abandoned at this point. Me and another Maeda killed a monster down there. It used to be human but I don’t know what they are doing with our people.” Ten stated with fear and hope in her voice. His words carried the weight of truth behind them – he had infected Nobu, he had lost his companion, not by death but by choice. That had been his greatest fear, and with it behind him, Kazuhiko did his best to proceed as normal, despite the feelings of abandonment and loneliness. To him, life was a journey, and he had a lot left to live, a lot left to prove, not only to himself, but to everyone who doubted him. He was a strong, independent Maeda who didn’t need no man. A hand traipsed over, and he placed it on his cousin’s back, as if to reassure her. “But yes, I’ll go with you if it makes you feel better. Whatever you saw down there was like it was because it didn’t come to us. You forget how resourceful our clan is – what we can’t prevent, we can fix. We just need time.” He offered her a reassuring smile as before leading his cousin down a corridor. While he didn’t know where they were going, he did know his way out of the Sector and how to get them started on the path to where ever it was that they were going. He looked over at Ten. He loved his mother just as much as she did, though it was difficult for him to empathize with her loss. Part of him felt like she was clinging to false hope – it was a common occurrence for the children of shinobi, particularly the ones that never received closure. Whatever she saw could very well have been a genjutsu. He made a mental note to check: If anything, he knew an Enari that could help the two of them sift through whatever chakra remnants remained at wherever it was that she was taking him. If she had something of her mothers, perhaps he could even help Ten locate her, provided that she was still alive. A few more minutes of walking took the two of them past the Sector’s checkpoint and into the labyrinth that was the sewers.